For the following sections, we need some sample data. We can copy and paste some from IMDB. If we typed go into search box, we would see two movies are filtered: The Good, the Bad and the Ugly and The Godfather. If we typed Gandalf we wouldn&apos;t be able to find anything. By default, Sergen determines first textual field of a table as the name field. In movies table it is Title. This field has a QuickSearch attribute on it that specifies that text searches should be performed on it. 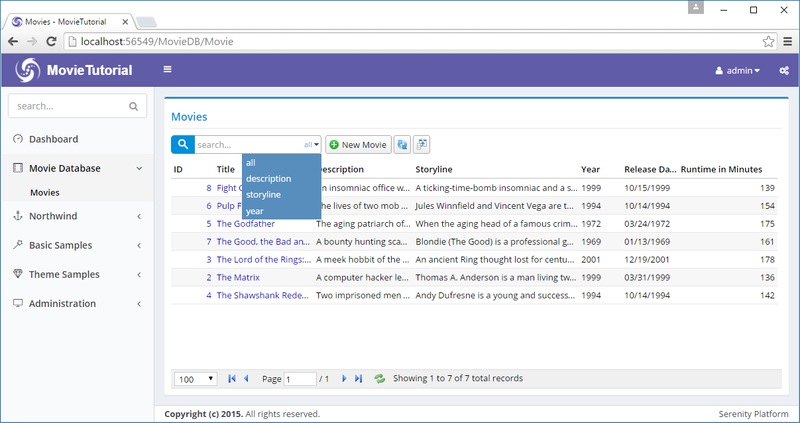 The name field also determines initial sorting order and shown in edit dialog titles. Code generator determined that first textual (string) field in our table is Title. 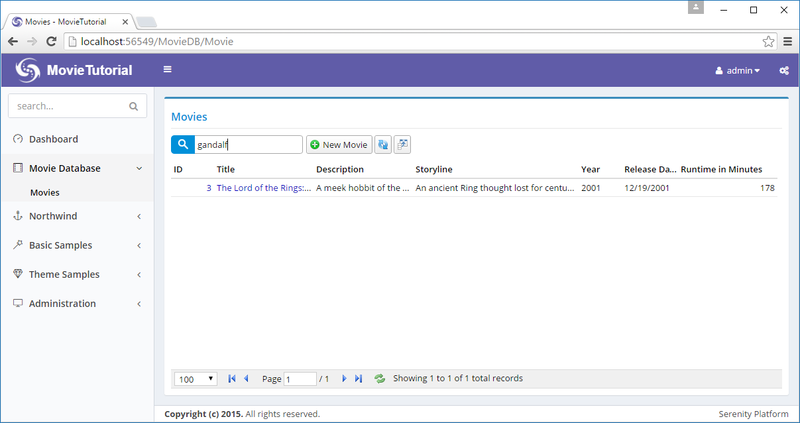 So it added a INameRow interface to our Movies row and implemented it by returning Title field. If wanted to use Description as name field, we would just replace it. 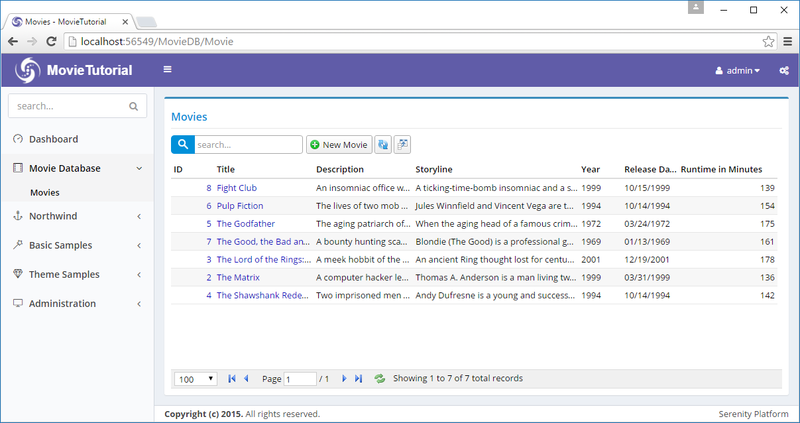 QuickSearch attribute, by default, searches with contains filter. It has some options to make it match by starts with filter or match only exact values. Here this quick search feature is not very useful, but for values like SSN, serial number, identification number, phone number etc, it might be. You might have noticed that we are not writing any C# or SQL code for these basic features to work. We just specify what we want, rather than how to do it. This is what declarative programming is. It is also possible to provide user with ability to determine which field she wants to search on. Serene contains some T4 (.tt) files to transfer such information from server side (rows etc in C#) to client side (TypeScript) for intellisense purposes. Before running these templates, please make sure that your solution builds successfully as templates uses your output DLL file (MovieTutorial.Web.dll) to generate code. After building your solution, click on Build menu, than Transform All Templates. You don&apos;t have to transform templates in ASP.NET Core version. Serene does it automatically on build. Actually, there isn&apos;t any T4 file in ASP.NET Core version. So from now on, when we say transform templates, just build your project (if you use ASP.NET Core version). It is also possible to open a command prompt in project directory and type dotnet sergen t to transform templates manually. Local text keys for row fields are generated from "Db." + (LocalTextPrefix for Row) + "." + FieldName. Their values are generated from [DisplayName] attributes on your fields by but might be something else in another culture if they are translated. LocalTextPrefix corresponds to ModuleName + "." + RowClassName by default, but can be changed in Row fields constructor.